It was actually rather easy. 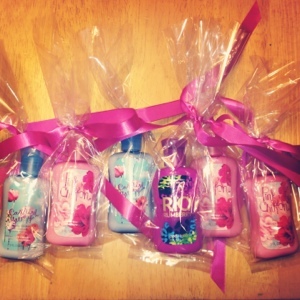 Start off buying some of Bath and Body Works' little lotion. We chose the newer scents... They smell amazing! 3 for $10. The sweet lady gave me the clear baggies and ribbon. Free! :) Drop each in and tie with little man's "help". 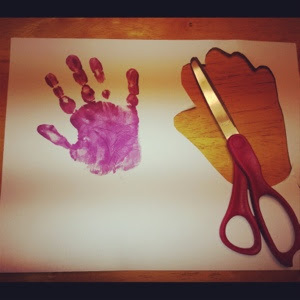 With paint we already had... Acrylic.. We stamped out little man's cute hand onto card stock. Free... Already own! :) Then I cut out the shape. 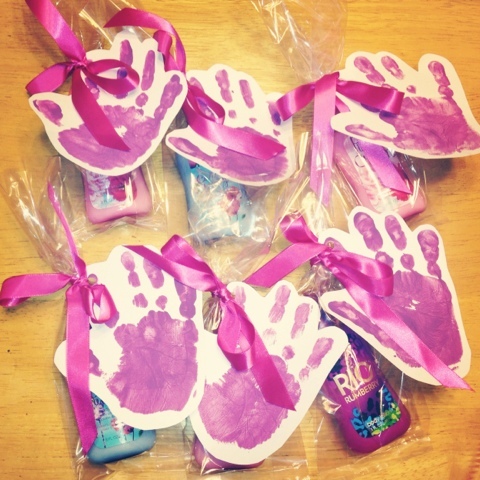 Using Cay's markers, we came up with corniness using the terms "high five," "hands down," "you deserve a hand," etc. He proudly wrote his name... His newest accomplishment. With a hole puncher, we tied the hand to the bag, and finished with a bow. Total of about $22. The only expense was the lotion. You REALLY want to play the cognitive game, huh! ?